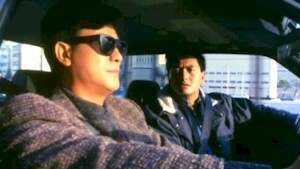 The Skinny: Chow-Yun Fat goes undercover, joining a band of hoods and befriending jewel thief Danny Lee along the way. For Chow, it all comes down to a question of honor versus justice in a movie that Quentin Tarantino liked so darn much, he remade it as Reservoir Dogs. What's more important, loyalty or justice? That's the dilemma facing undercover cop Ko Chow (Chow Yun-Fat) in Ringo Lam's excellent crime drama City on Fire. The film is a definite must see for HK enthusiasts, if for no other reason than to witness what a Ringo Lam movie was like before he became Jean Claude Van Damme's director of choice. Like Donnie Brasco and other films of its kind, City on Fire explores the internal ethical struggle for a policeman who get too close to his prey. The plot: after a fellow cop is knifed to death in the streets, detective Ko Chow is put on the trail of some jewel thieves by his world-weary superior, Inspector Lau (Sun Yeuh). Chow, however, has deep reservations about the assignment. "I fulfill my duties?" Chow complains, "But I betray my friends!" Despite his protests, Chow agrees to the job and attempts to befriend head crook Lee Fu (Danny Lee). After a few tense situations, Chow is eventually accepted into the Fu's confidence and asked to join in on the crew's next big score. As the two strike up a friendship, Chow's personal ethics are put to the test as he finds himself genuinely liking Fu, the very man he's supposed to arrest. Later, the climactic jewelry heist goes terribly wrong with bullets flying everywhere and bodies littering the streets. In the end, Chow is forced to make a definitive, but not surprising, decision on where his loyalties reside, with fatal results.